December » Barringer & Barringer Inc.
Plant Environment: Sunny location with well drained soil. Drought tolerant once established. 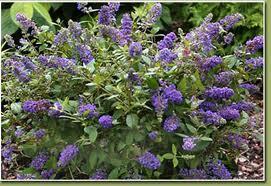 Plant Bloom: Fragrant bright blue flowers that appear during the summer months. Will repeat blooming with deadheading of spent blooms. A great new introduction for plant and butterfly enthusiasts! The compact growth habit of this deciduous shrub enables it to be used in the landscape or as a container plant. Pruning maintenance is minimal for this variety. An enmasse planting would offer generous color throughout the summer and prove to be a butterfly and hummingbird magnet. Hopefully, more exciting colors in this plant series will be offered in the near future.